When I saw the press release for the China Glazes Hunger Games colors I was hoping that Luxe & Lush would be a golden version of Snow Globe. I'd love a Snow Globe color with gold iridescent glitters mixed in. I'm sure that's not surprising since I love any type of gold shimmer or glitter. Sadly, this was no the case, but it was cool to know this was a flakie. I can't argue with a flakie! 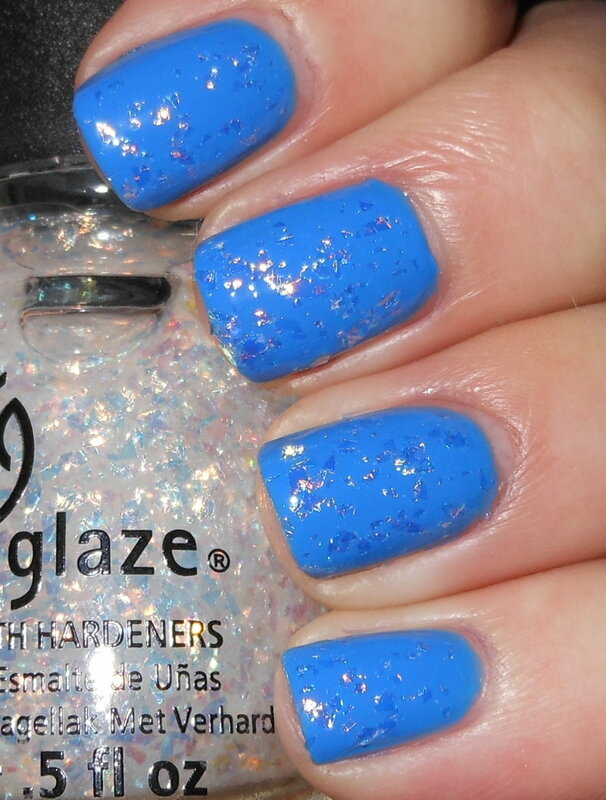 Luxe and Lush is a mix of larger clear/white iridescent flakies in a clear base. These are larger more textured flakies than Essie Shine of the Times, SH Hidden Treasure, and the family of dupes behind that. This is similar to Color Club Covered in Diamonds, but the formula is exceptionally better. The formula is easier to work with. The flakies though they are larger do smooth out nicely on the nail. It is not clumpy or bumpy. I love it over this blue. It makes my nails look like icicles! I really recommend layering these over light-medium shades. We all have seen these flakies over dark colors or black, but personally I find these are beautiful over lighter colors, you can really see the spectrum of colors in these flakies that way. this looks awesome over blue! This looks great! It does have a chilly feel to it. I literally just finished putting this on (CG Luxe) but I paired mine over Essie Nice is Nice. It looks so good over that blue! Such a pretty combo!! I finally gave in and picked up Luxe and Lush the other day (mostly because it was on sale, lol!). I was nervous about the size of the flakies. But I've been seeing some great combos with it. Like this one! I really like this mani! Luxe and Lush is the last Hunger Games color I want to get...it's so pretty!